Eisbaeren Berlin’s imported American JIMMY SHARROW (3), the native of Framingham, Massachusetts, who led all defensemen with five goals scored during the 32-team European Trophy tournament earlier this term, shields the puck from the Hannover Scorpions’ diving Canadian legionnaire SCOTT KING, the 35-year-old former Boston University right wing who ranks third on the Lower Saxon club in scoring this season, during the Deutsche Eishockey Liga contest at the TUI Arena in Lower Saxony. Two goals in the second period and 34 saves from the German Olympic veteran playing in one last domestic game before returning to his regular National Hockey League club powered the hosting HANNOVER SCORPIONS to a thorough 4-1 triumph over two-time defending champion EISBAEREN BERLIN in the Deutsche Eishockey Liga. Because word that an impending settlement to end the “Lock-Out” situation in the National Hockey League had already traveled all the way across the Atlantic Ocean hours before, none of the exiled NHLers who have been skating in the Deutsche Eishockey Liga appeared for their German clubs in Sunday’s round of D.E.L. contests — with one very signifcant exception in Lower Saxony, of course. 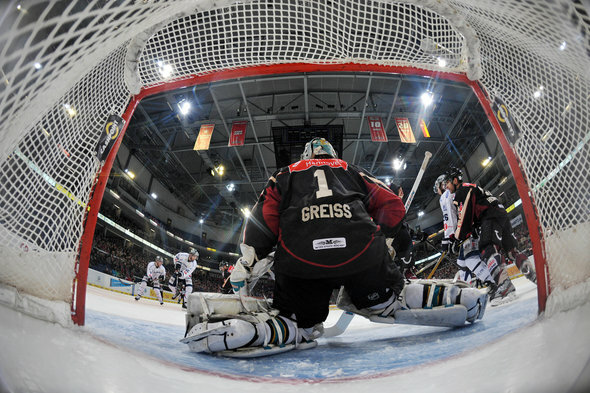 THOMAS GREISS, the 26-year-old netminder who appeared in 19 NHL games (2.30 avg, .915 svpct) last season while serving as the backup for the San Jose Sharks, would certainly give Eisbaeren every reason to wish that had not been the case in Hannover, though. The Scorpions, to review had entered the match with visiting Berlin tied with two other teams for ninth spot in the fourteen-team Deutsche Eishockey Liga this term. But the resilient Greiss, who had been something less than dominant in the German top flight since signing with the Hannover Scorpions in the latter half of November this past fall, clearly saved his very best stuff to coincide with one final appearance in the D.E.L. this season (9 ga, 3.47 avg, .905 svpct). Hannover Scorpions goaltender THOMAS GREISS (1), the veteran of 38 NHL games for the San Jose Sharks who represented Germany at the final tournaments of both the 2006 and 2010 Winter Olympic Games in Italy and Canada, respectively, guards the net against defending champion Eisbaeren Berlin at the TUI Arena in Lower Saxony on his last appearance in the Deutsche Eishockey Liga for this 2012/13 season. Hannover Scorpions were coming off a very disheartening 5-1 loss away to bottom-of-the-table EG Duesseldorf on Friday night (with Germany national team and NHL veteran DMITRI PAETZOLD having featured in goal for the Lower Saxons). Indeed, it was was the visitors icing the same (tired?) 17 skaters that had participated in the history-making “D.E.L. Winter Game” a day earlier in Nuremberg who had the better of play in the opening period at the TUI Arena in Lower Saxony. But, despite outshooting their hosts 11-7 in the first twenty minutes, understrength Eisbaeren Berlin could not solve the departing Greiss. Eisbaeren Berlin’s imported American right wing BARRY TALLACKSON, the former University of Minnesota product who finished second with both 29 goals and 61 points for the German capital city club in all competitions last season, had two outstanding opportunities with the one-timer but could not find the back of the net. Greiss stoned the ex-New Jersey Devils farmhand in the first period and then Tallackson outright whiffed early into the second session at the TUI Arena. Both chances had been created by Canadian legionnaire DARIN OLVER, the former Northern Michigan University center who topped Eisbaeren Berlin with both 30 goals and 67 points in all competitions a year ago. Shortly after Tallackson’s big swing and miss, the hosts jumped on the scoreboard first after a long rush by ANDY REISS, the 26-year-old defenseman who appeared in three contests (0 go, 0 as) for Germany at the 2008 IIHF World Championships in Canada. Eisbaeren Berlin’s reserve netminder SEBASTIAN ELWING might have done more to keep out the wrist shot from the right circle on a sharp angle, it must be said. Nevertheless, a very first goal of this D.E.L. season from Reiss put Hannover Scorpions in front at the 5:28 mark of the second period. Eisbaeren Berlin backup netminder SEBASTIAN ELWING (25), the 32-year-old former youth team product who was re-signed by the German capital city club from EHC Red Bull Munich this past summer, permits the first goal of the Deutsche Eishockey Liga contest with the hosting Hannover Scorpions at the TUI Arena in Lower Saxony. Hannover Scorpions might have had a second goal in the 33rd minute after a blast from top scorer IVAN CIERNIK, the aging NHL veteran who has represented Slovakia at the annual IIHF World Championships on four occasions (23 ga, 7 go, 12 pts) in his career, smacked the crossbar and bounced downwards. No luck for the 35-year-old right wing who leads the Lower Saxony club with both 17 goals and 33 points after transferring from Swedish second division side IF Malmo this past summer, then. But the last team other than Eisbaeren Berlin to win the Deutsche Eishockey Liga title would double its advantage soon enough, anyway. A smooth pass from veteran Canadian legionnaire CHRIS HERPERGER, the 38-year-old right wing who was chosen in the 10th round (# 223 overall) by the Philadelphia Flyers at the 1992 National Hockey League Draft and later appeared in 169 NHL games (18 go, 43 pts) for the Chicago Black Hawks, Ottawa Senators and Atlanta Thrashers, made it all happen. And rookie TIM RICHTER, the 23-year-old right wing who is skating his first season in the German top flight after signing from 2.Bundesliga side SC Riessersee, made no mistake with his one-on-one opportunity against the Eisbaeren reserve netminder. Richter’s second goal in the D.E.L. this term left the struggling visitors staring at a 2-0 deficit with a little less than two minutes remaining in the second period. Eisbaeren Berlin did strike back quickly shortly before the second intermission arrived, however, after veteran Slovak import MARTIN HLINKA of Hannover Scorpions received a double minor for holding and slashing at the 38:29 mark of the match at the TUI Arena. Greiss finally conceded on the power play when Olver, the 27-year-old veteran who led the entire Deutsche Eishockey Liga in scoring for the Augsburg Panthers during the 2010/11 campaign, simply skated into the right face-off circle and fired home for Eisbaeren at the 19:03 mark of the second period. Olver’s seventh goal in the D.E.L. this term (in just his 16th league contest of the season) gave the visitors renewed hope but Hannover would, ultimately, kill of the second penalty issued to Hlinka. 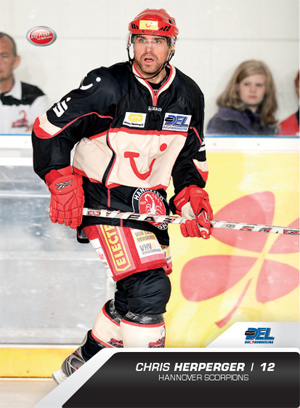 Hannover Scorpions’ veteran import MARTIN HLINKA (14), the 36-year-old Slovakian center who originally signed with D.E.L. club Kassel Huskies in the summer of 2005 after a season and a half skating for the Hershey Bears in the American Hockey League (82 ga, 11 go, 43 pts), beats Eisbaeren Berlin goaltender SEBASTIAN ELWING (25) to the stick side, top shelf during the Deutsche Eishockey Liga contest watched by 3,806 spectators at the less than half-full TUI Arena in Lower Saxony. Eisbaeren Berlin had plenty of chances to draw level in the third period but would find the NHL refugee between the pipes for the Hannover Scorpions at the TUI Arena in an uncompromising mood; the two-time defending champion outshot the 2010 D.E.L. titlist by the margin of 12-11 in the final frame (35-32 for the entire game) but were kept off the scoreboard by the in-form Greiss. Hlinka, the experienced center who is now skating his seventh season with the Lower Saxon club, atoned for his second period sins by scoring a huge insurance goal for the Hannover Scorpions with just a little over four minutes remaining in the contest with Eisbaeren Berlin. It was a fourth goal of this D.E.L. term from Hlinka, who, like Olver, has missed more than half of this 2012/13 schedule on account of injury. And enough to effectively shut the door on Eisbaeren, as well. An empty net goal from rookie SERGEJ JANZEN, the 25-year-old native of Russia who spent most of the previous seven seasons skating for the Fischtown Pinguine in the German second division, set the final numbers for jubilant Hannover Scorpions. Hannover Scorpions goaltender THOMAS GREISS, the NHL exile preparing to rejoin the San Jose Sharks now that the labor situation in North America has finally been settled, receives a deserved pat on the head from leading scorer IVAN CIERNIK (27), the veteran Slovakia international who skated in 89 NHL games (12 go, 26 pts) over parts of five seasons for the Ottawa Senators and Washington Capitals before joining German club Wolfsburg Grizzly Adams in the summer of 2004, after the Deutsche Eishockey Liga triumph over two-time defending champion Eisbaeren Berlin at the TUI Arena in Lower Saxony. 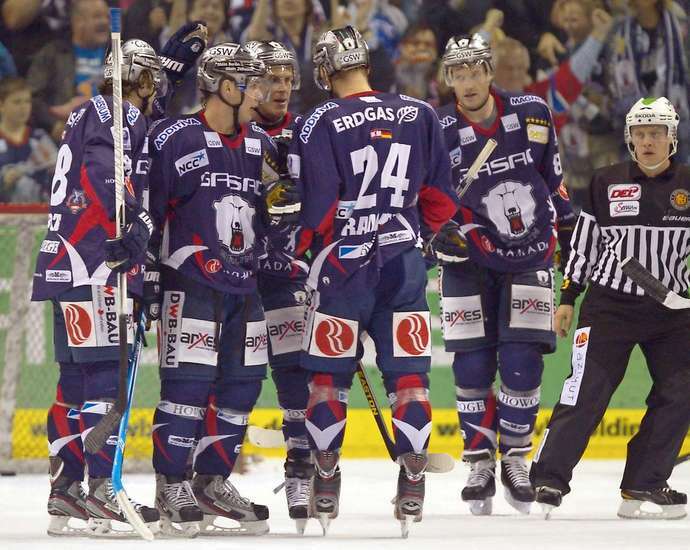 A clutch overtime goal by a youthful player only recently returned from injury lifted visiting EISBAEREN BERLIN to an important 4-3 triumph over the host HANNOVER SCORPIONS in a clash of the two Germans teams to have claimed the last five titles in the Deutsche Eishockey Liga. American trainer DON JACKSON’s side were, of course, skating away from home for a third consecutive time beginning with the trip to Sweden for the vital European Trophy contest with HF Lulea but had lost on its last domesitc outing in Bavaria opposite the Straubing Tigers. And, much to the dismay of the former defenseman who patrolled the blueline for the powerhouse Edmonton Oilers in the National Hockey League back in the day, the 2010 Deutsche Eishockey Liga champion had struck for a Blitztor just one minute and four seconds into the match with Eisbaeren Berlin via GERRIT FAUSER, the former Germany U-20 international who had previously played two years in Canada with the Gatineau Olympiques in the Quebec Major Junior Hockey League and later signed with the Lower Saxon side Hannover Scorpions after spending most of the 2010/11 season with the Fischtown Pinguins in the 2.Bundesliga. Eisbaeren Berlin winger LAURIN BRAUN (12) is squashed in the goal crease as visiting defenseman THOMAS SUPIS (6), the former youth team product who appeared in 28 games for the D.E.L. champion last season, sweeps the puck into the Hannover Scorpions’ net to register his very first strike of his career in the German top flight during the closely-contested Deutsche Eishockey Liga match at the TUI Arena in Lower Saxony. It took the two-time defending D.E.L. titlists just two minutes to respond, however, after Eisbaeren Berlin’s 20-year-old rearguard THOMAS SUPIS scored his first-ever goal in the Deutsche Eishockey Liga after a scramble in the crease. Despite a combined total of 27 shots-on-goal almost perfectly divided between the two opposing sides the rest of the period remained scoreless. And so, the north German rivals adjourned to their respective “cabins” for the first intermission. Eisbaeren Berlin’s star Canadian legionnaire CLAUDE GIROUX (28), the exiled Philadelphia Flyers center who was the third-leading scorer in the 30-team National Hockey League last season, is neutralized by Hannover Scorpions captain SASCHA GOC (7), the one-time 6th round selection (# 159 overall) of the New Jersey Devils at the 1997 National Hockey League Draft who later skated 22 NHL games for the Devils and the Tampa Bay Lightning before signing with Adler Mannheim in the summer of 2003, during the tense Deutsche Eishockey Liga contest at the TUI Arena in Lower Saxony. Hannover Scorpions’ veteran Canadian legionnaire SCOTT KING, the aging 35-year-old, one-time Boston University center who is skating his 11th season in the Deutsche Eishockey Liga these days, returned the Lower Saxon club to the lead a little past the five-minute mark of the second period. The native of Saskatoon, Saskatchewan, originally inked his first German contract with 2.Bundesliga side EC Bad Toelz after totaling 102 points (40 goals) in 72 games for the Charlotte Checkers during the 2000/01 East Coast Hockey League campaign. A fourth strike of the year, then, for the Hannover Scorpions’ second-leading goal-scorer this term, who had also tallied in the Lower Saxon club’s earlier meeting with Eisbaeren Berlin this season. Eisbaeren Berlin’s superstar Canadian legionnaire CLAUDE GIROUX (28) visited the Lower Saxony city of Hannover and the TUI Arena of the Explo Plaza for the first time since arriving in Germany after the National Hockey League labor talks did not go over so well in North America earlier this fall. The visitors from the German capital city, however, counterattacked for a pair of lightning-quick goals to turn the tide just past the midway point of the match. First, 2010 Germany Olympic forward T.J. MULOCK found the back of the net after some preparatory work from NHL-Superstar CLAUDE GIROUX and young winger LAURIN BRAUN. A fifth goal of this D.E.L. season, then, for the seasoned, 27-year-old native of British Columbia, who leads Eisbaeren Berlin with 19 points in the German elite league this term, as well. The veteran Mulock also tops the capital city club with 31 points, including the eight European Trophy contests. Eisbaeren Berlin’s superstar Canadian legionnaire CLAUDE GIROUX (28), who has scored three goals in six D.E.L. games since being locked out by the Philadelphia Flyers, is stopped by Hannover Scorpions netminder DMITRI PAETZOLD, the veteran Germany national team netminder who was chosen in the fourth round (# 107 overall) of the 2001 National Hockey League Draft by the San Jose Sharks and later spent five seasons playing professional hockey at three different levels (NHL, AHL, ECHL) in North America, during the Deutsche Eishockey Liga contest at the TUI Arena. First-year Canadian legionnaire JAMIE ARNIEL, the 22-year-old right wing who skated one game for the eventual Stanley Cup champion Boston Bruins during the 2010/11 National Hockey League season, then scored less than a minute later to give visiting Eisbaeren Berlin a 3-2 lead at the 31:53 mark. An important third goal of this D.E.L. season (and fourth in all competitions) for the summer signing who has skated in every domestic league match for his new employers thus far this term. The new-arrival Arniel, of course, slumped to just seven goals in 74 games for the Providence Bruins of the American Hockey League last season after netting 23 goals in 78 AHL games for Boston’s top farm club the previous season. Drawing the assists were the novice goal-scorer Supis as well as the in-form Canadian legionnaire and NHL veteran, MATT FOY. Eisbaeren Berlin’s superstar Canadian legionnaire DANNY BRIERE (84), the 35-year-old right wing who has appeared at two IIHF World Championships (18 ga, 6 go, 17 pts) for his native country and won the gold medal on both occasions (2003 and 2004) in his career, battles with Hannover Scorpions defenseman SASCHA GOC (7), the 33-year-old veteran who has represented Germany at four major international tournaments (23 ga, 1 go, 3 pts), including the 2006 Winter Olympic Games in Turin, Italy, during the D.E.L. contest at the TUI Arena in Lower Saxony. Although it had not been the case in the prior twenty minutes of play at the TUI Arena at the Expo Plaza, the last period clearly belonged to the home side, who would outgun their guests 15-9 in the final frame. All the pressure finally paid off with just over nine minutes remaining when veteran Denmark international MORTEN GREEN, the off-season acqusition from Swedish second division side IF Malmo Redhawks, scored just his second goal of this Deutsche Eishockey Liga season for the Lower Saxon club. Enabling the Dane had been the Canadian legionnaire King as well as the veteran left wing ANDREAS MORCZINIETZ, the aging 34-year-old who once represented Germany at five major internatonal touranaments (26 ga, 6 go, 12 pts), including the 2002 Winter Olympic Games at Salt Lake in the United States, and collected his second assist of the contest with Eisbaeren Berlin. The Hannover Scorpions, trained by the former Latvia international forward IGOR PAVLOVS, could not find a winner before the end of the third period, though, and so it was off to overtime with visiting Eisbaeren Berlin. Hannover Scorpions’ imported winger MORTEN GREEN (13), the 31-year-old veteran of Swedish league hockey who has represented Denmark at 10 major international tournaments (60 ga, 10 go, 39 pts) and captained his country at the past two IIHF World Championships, evened the Deutsche Eishockey Liga contest with visiting Eisbaeren Berlin in the third period at the TUI Arena of the Expo Plaza in Lower Saxony. Now, the Hannover Scorpions had been able to upset Eisbaeren earlier this season at the O2 World Arena Berlin — but the 2011 and 2012 Deutsche Eishockey Liga champions were not about the allow that to transpire once again. 21-year-old winger LAURIN BRAUN, who missed the capital city club’s last four matches including the big European Trophy triumph against HF Lulea in Sweden thru injury, celebrated his return to the line-up by knocking home the winner for Eisbaeren Berlin roughly two and a half minutes into extra time. A sixth goal of the D.E.L. season for the emerging Braun as well as an important bounce-back win for proud Eisbaeren Berlin, who have now won seven of their last nine contests in the Deutsche Eishockey Liga after the notoriously dreadful start to this domestic season. While his brother CONSTANTIN BRAUN (90), a regular Germany national team defenseman and National Hockey League draft pick of the reigning Stanley Cup champions, lay on the ice in the crease, youthful winger LAURIN BRAUN (left) gives a shout to celebrate his overtime goal in the Deutsche Eishockey Liga contest with the Hannover Scorpions at the TUI Arena of the Expo Plaza in Lower Saxony. Hannover Scorpions defenseman ANDY REISS (96), the 26-year-old who appeared in three games for Germany at the 2008 IIHF World Championships, cannot block the goal-bound slapshot off the stick of Eisbaeren Berlin’s seasoned Canadian legionnaire TYSON MULOCK (62) during the Deutsche Eishockey Liga contest at the O2 World Arena Berlin. In a fixture involving the last two teams to have won the Deutsche Eishockey Liga title, nearly fifty shots-on-goal from the two-time defending champion were not enough to get the job done as visiting HANNOVER SCORPIONS upended EISBAEREN BERLIN 4-2 in front of an audience of 13,800 at the O2 World Arena Berlin in the capital city of Germany. Eisbaeren Berlin looked to have made a good start when veteran Canadian legionnaire TYSON MULOCK, the 29-year-native of British Columbia who first signed to skate in Germany with third division EHC Neuwied to start the 2004/05 campaign and has been with the capital city club ever since the summer of 2007, notched his first D.E.L. goal of the season with roughly three and a half minutes to play in the opening period. Hannover Scorpions, who claimed the D.E.L.’s top prize to conclude the 2009/10 German ice hockey schedule, responded thru the veteran import originally from Slovakia, 36-year-old MARTIN HLINKA, less than a minute before the first intermission arrived, however. 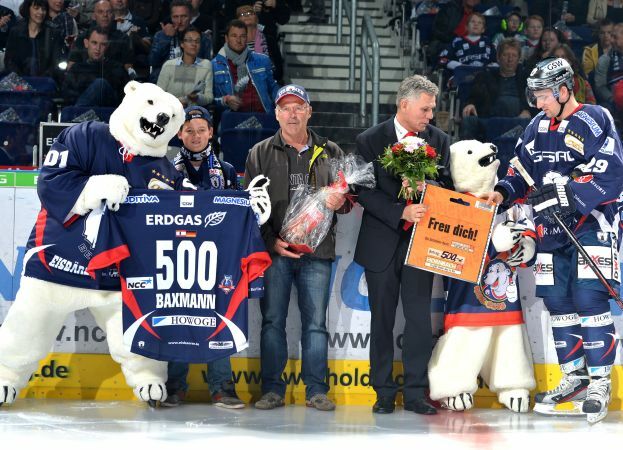 Long-serving rearguard JENS BAXMANN (29) is rewarded for his service to EISBAEREN BERLIN while celebrating his 500th career appearance (both regular season and playoffs) in the Deutsche Eishockey Liga prior to the match with visiting Hannover Scorpions at the O2 World Arena Berlin. Slovakia international IVAN CIERNIK, the 34-year-old right wing who once appeared in 89 NHL games (12 go, 26 pts) for the Ottawa Senators and Washington Capitals then later scored 123 goals in 261 D.E.L. contests for Koelner Haie, gave the Hannover Scorpions a lead it would never relinquish by netting his very first strike for the club from Lower Saxony just 30 seconds into the second period; Ciernik, who skated in 23 games (7 go, 12 pts) while representing his homeland at the annual IIHF World Championships on four occasions from 2006 to 2010, returned to the German top flight this summer after spending last term with Swedish second division outfit IF Malmo. 35-year-old Canadian legionnaire SCOTT KING, the one-time Boston University right wing who originally signed in Germany to start the 2001/02 campaign with second division EC Bad Tolz, claimed what proved to be a pivotal third goal for Hannover Scorpions twenty seconds past the halfway mark of the match. MARTIN HLINKA played four years of NCAA college hockey in the United States for little Augsburg College before embarking on his professional career with the Quad City Mallards of the old United Hockey League and ultimately working his way up to the American Hockey League, where the native of Slovakia skated in 192 AHL games for the Portland Pirates as well as the Hershey Bears before signing to play the 2005/06 season in Germany with the Kassel Huskies. Trailing by a pair heading into the final period, the determined hosts let loose with an unyielding barrage but would be denied by fine goalkeeping from the Hannover Scorpions’ Germany international DIMITRI PAETZOLD. 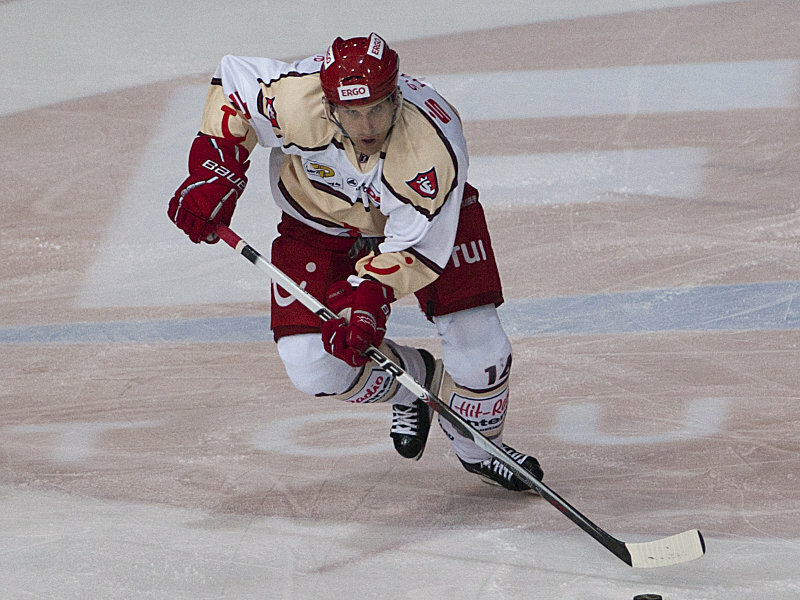 Eisbaeren Berlin forward FLORIAN BUSCH, who leads the capital city club in scoring with six points (two goals) in the D.E.L. this early season, managed to get a puck past the 29-year-old, former San Jose Sharks prospect who appeared in three NHL games once upon a time. But, despite outshooting their guests by an overwhelming 21-7 margin, the Eisbaeren never did find an equalizer. Paetzold, the native of Kazakhstan who made one start between the pipes for Germany at the 2010 Winter Olympic Games hosted by the western Canadian city of Vancouver, totaled 47 saves in all at the O2 World Arena Berlin. Hlinka, who transferred to Hannover Scopions in the summer of 2007 and, thus, can point to a D.E.L. title on his resume, added his second goal of the game in Berlin with the net unguarded about a minute from the end. The HANNOVER SCORPIONS completed the three-game sweep of the AUGSBURG PANTHERS at home in front of 10,496 at the TUI Arena in Lower Saxony to lift their first-ever elite ice hockey championship in Germany. THOMAS DOLAK, the hero for Hannover with the overtime winner in Game Two, scored a power play goal for the Scorpions with just 1:49 remaining in Game Three to clinch the domestic title in dramatic fashion. 35-year-old aging German international TINO BOOS added an empty net goal just 38 seconds later as Hannover held off a brave Augsburg 4-2 in the decisive match of the DEL finals. The Scorpions came out firing on all cylinders and launched 20 shots at the Augsburg goal in the opening period. Once again, however, much to the chagrin of Hannover head coach HANS ZACH’s charges, German Olympic goaltender DENNIS ENDRAS of the Panthers showed impressive form. Hannover finally found a hole in Endras’ wall with nearly seven minutes played in the second period when 33-year-old veteran German international KLAUS KATHAN, who appeared at both the 2002 and 2006 Winter Olympic Games, collected his third playoff goal. The Scorpions struck again twelve and a half minutes into the middle frame with a goal from former NHL forward CHRIS HERPERGER to assume a 2-0 advantage; for the 36-year-old, a goal then in each of the three DEL final series games. It shall be noted that the Augsburg Panthers, with their backs already to the wall entering the contest, answered the call in the third period. THOMAS KEMP put the Panthers on the scoreboard with a power play goal at 5:09 and DARREN OLVER (Northern Michigan Univ), who assisted Kemp, evened the match for Augsburg eleven and a half minutes into the final period with help from defenseman JEFF LIKENS (Wisconsin Univ). The Hannover Scorpions, who finished with a rather considerable 45-28 edge in shots-on-goal, would have the final say in the latter stages of the match. 61-year-old HANS ZACH will retire in style as head coach of the recently crowned Deutsche Eishockey Liga champions, the HANNOVER SCORPIONS. The first-ever German championship in the history of the Scorpions’ club marks the fourth elite league championship for Zach, who won three titles with EG Dusseldorf from 1991 thru 1993 in the old Bundesliga. Zach, a former West German international as a player who skated at the famed 1980 Lake Placid Winter Olympic Games, was coach of the German national team from the 1999 World Championships (B pool) thru the 2004 World Cup of Hockey. 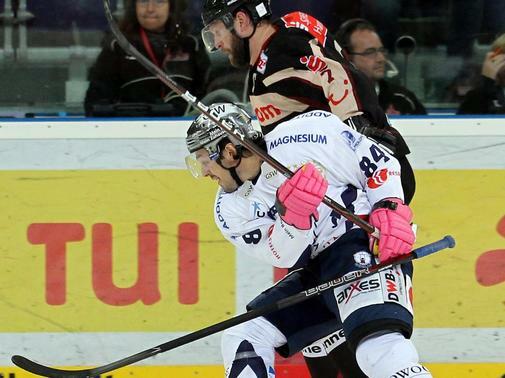 Visiting German forward THOMAS DOLAK stung the Augsburg Panthers with a goal 1:30 into overtime to give the Hannover Scorpions a dramatic 3-2 victory in Game Two of the Deutsche Eishockey Liga championship and a commanding 2-0 lead in the best-of-five series. Hannover took the lead in the 11th minute of the match very much against the run of play as former NHLer CHRIS HERPERGER netted his second goal of this year’s German finals; Augsburg outshot the Scorpions 11-5 for the opening period. Canadian import Herperger, who arrived in Hannover from Swiss club EHC Kloten in the summer of 2007, scored 12 goals in 39 games for the Scorpions during the regular season; the former Chicago Black Hawk / Ottawa Senator / Atlanta Thrasher now totals a team-leading six goals in ten DEL playoff games this spring. Assisting Herperger was fellow Canuck ADAM MITCHELL (Colgate Univ), who now heads Hannover with 12 points from ten post-season contests; the 27-year-old forward who began his professional career in the German third division with EV Landsberg counted 32 points from 56 regular season games. German DAVID WOLF handed Hannover a 2-0 advantage six and a half minutes into the second period with his third goal of the playoffs; the 20-year-old forward, in his rookie DEL year after two seasons with Eispiraten Crimmitschau in the second division, scored four goals in 54 games for the Scorpions during the regular season. But the Augsburg Panthers, who applied consistent pressure all game, were not prepared to go quietly into the night before a capacity crowd of 7,774 at the Curt Frenzel Stadion in Bavaria. DARIN OLVER (Northern Michigan Univ), the New York Rangers 2nd round draft choice (2004, #36 overall), produced a power play goal midway through the game for the Panthers, who launched 19 shots at the Scorpions goal in the second period alone. 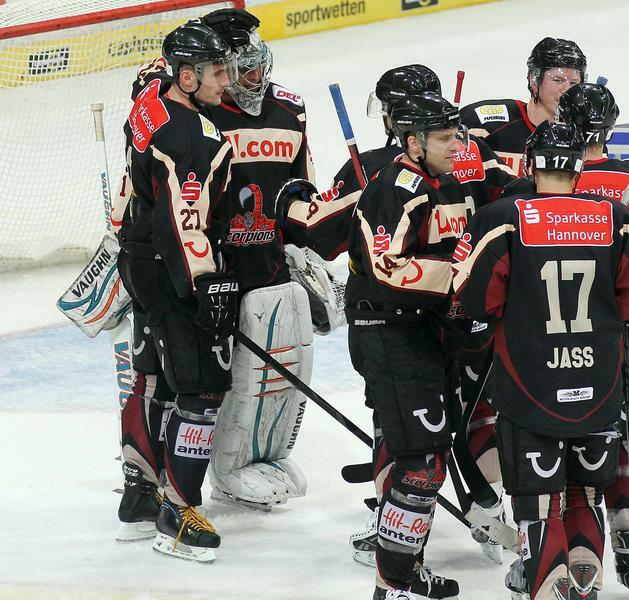 Augsburg, inspired by the energetic support at home, made an all-out effort in the third period and outshot Hannover by the lopsided 15-4 margin for the final twenty minutes. For the game, the final shots-on-goal total spoke volumes : Augsburg 45 – Hannover 23. COLIN MURPHY (Michigan Tech Univ), a rookie in Germany after four seasons in the American Hockey League, finally evened the match for the Panthers with just 2:28 remaining in regulation play. The veteran Dolak, however, put a damper on the prospects of a complete comeback for the crowd at the venerable Curt Frenzel Stadion. The 34-year-old Scott seeks his third league championship the past four seasons. The veteran goaltender, who made one unsuccessful appearance for the Los Angeles Kings during the 2000-01 campaign, has the opportunity for a unique hat trick of titles. Scott has triumphed in the old Russian Super League with Metallurg Magnitogorsk (2007) as well as in the Erste Bank Eishockey Liga with Austrian club AC Klagenfurt last spring. The HANNOVER SCORPIONS took a giant step towards their first-ever German title with a 3-1 triumph over the AUGSBURG PANTHERS in Game One of the Deutsche Eishockey Liga finals in front of 7,596 Zuschauer at the TUI Arena in Lower Saxony. Despite consistent Hannover attack throughout the course of the match, German Olympic goaltender DENNIS ENDRAS (32 saves) was again dominant in front of goal for the underdog Augsburg squad. However, with just two and half minutes to play in the second period, the Scorpions finally succeeded. MATT DZIEDUSZYCKI (Univ of New Hampshire), a former top scorer for the Las Vegas Wranglers of the East Coast Hockey League, deposited the puck past Endras for the all-important first goal of the game. Slovak MARTIN HLINKA (Augsburg College), a one-time Hershey Bears forward in the American Hockey League, scored a significant goal halfway through the final period to give the Scorpions a two-goal lead. Imperative, in that CONNOR JAMES (Denver Univ), the erstwhile attacker of the AHL’s Scranton/Wilkes-Barre Penquins, did pull one back for the Augsburg Panthers twelve minutes into the third. But, Veteran Canadian Auslaender TRAVIS SCOTT (24 saves), the ex-Koelner Haie netminder who arrived via Austrian club AC Klagenfurt last summer, continued his fine playoff form for Hannover and would hold the fort for the Scorpions. Former Chicago Black Hawk forward CHRIS HERPERGER, a 10th round draft choice (# 223 overall) of the Philadelphia Flyers back in 1992, sealed the deal for the Scorpions with an empty net goal seven seconds from full time. 38-year-old Hannover defenseman ARIS BRIMANIS (Bowling Green Univ), the Flyers’ fourth round draft pick from 1992 who later skated 21 games for Philadelphia over parts of three seasons and totaled 113 NHL games all told including his time with the New York Islanders, Anaheim Mighty Ducks and St. Louis Blues, had two assists for the Scorpions in the match. A fine start for then for Hannover and head honcho HANS ZACH, who, once upon a time, was both a player and then coach for German national teams. Veteran German international defenseman SASCHA GOC scored on the power play 1:37 into extra time to give the HANNOVER SCORPIONS a 5-4 Semifinal Game Three victory over ERC INGOLSTADT as well as a first-ever place in the Deutsche Eishockey Liga playoff championship. The 31-year-old Goc, who last appeared for Germany at the 2006 Winter Olympic Games in Turin, paced Hannover with two goals in the decisive match and now boasts four from eight playoff games. The former National Hockey League rearguard registered 17 goals in 52 games for the Scorpions during the regular season. Goc, who contested 22 NHL games (0 go 0 as, 0 pts, 8 pim) for the New Jersey Devils and Tampa Bay Lightning, is the older brother of current German international and NHL forward MARCEL GOC of the Nashville Predators. Goc’s four playoff goals are tied for tops on Hannover with veteran Canadian import CHRIS HERPERGER, the one-time 10th round draft pick of the Philadelphia Flyers whose late third period goal in Game Three brought about overtime. Herperger, the 36-year-old center who skated 169 games (18 go 25 as, 43 pts, 75 pim) in the NHL for the Chicago Black Hawks, Ottawa Senators and Atlanta Thrashers, evened Game Three for the Scorpions with just three minutes minus two seconds remaining in regulation. Norwegian Olympian TORE VIKINGSTAD assisted on both Herperger’s game-tying goal as well as Goc’s overtime winner and finished with three assists for Game Three.